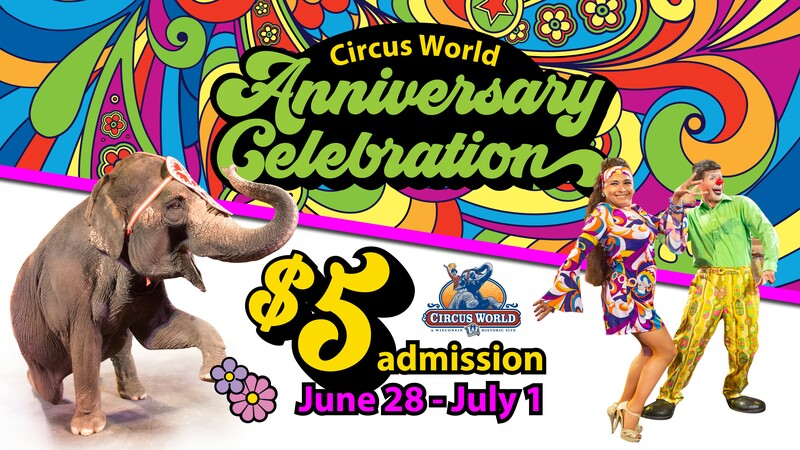 Celebrate Circus World’s 60th Anniversary with a remarkable $5.00 admission rate for everyone for these four days only. Circus World opened in 1959 with 2 buildings, on less than an acre of property, 6 circus wagons and the admission was 60 cents. Given the rate of inflation, 60 cents works out to about $5 today. Even though Circus World’s value has increased with the addition of over 200 wagons and vehicles, several new and historic buildings, and more than 60 acres… admission for these four days will be the same as in 1959.